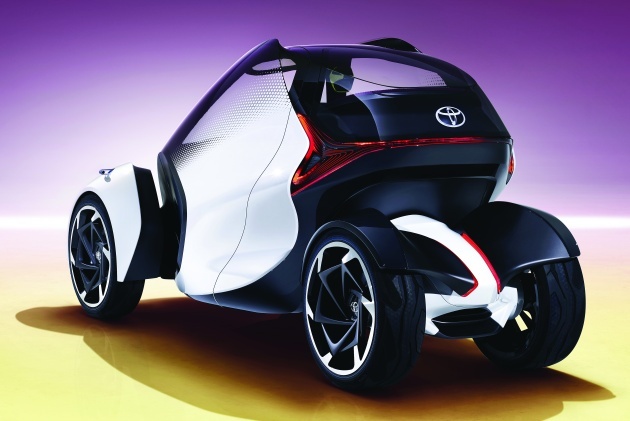 Toyota is making yet another foray into personal mobility after the i-ROAD – the Toyota i-TRIL, which makes its debut at the Geneva Motor Show, is the Japanese conglomerate’s vision of what a city car would look like in 2030, as an alternative to the traditional A- and B-segment hatchbacks. The car has been designed around small- to medium-sized towns (SMESTO) that are expected to spawn adjacent to existing cities, with the extensive amounts of stop-start driving projected requiring small, agile, urban-friendly vehicles. The target customer is a 30- to 50-year-old single mother of two with an “active” and “vibrant lifestyle” (yes, really). 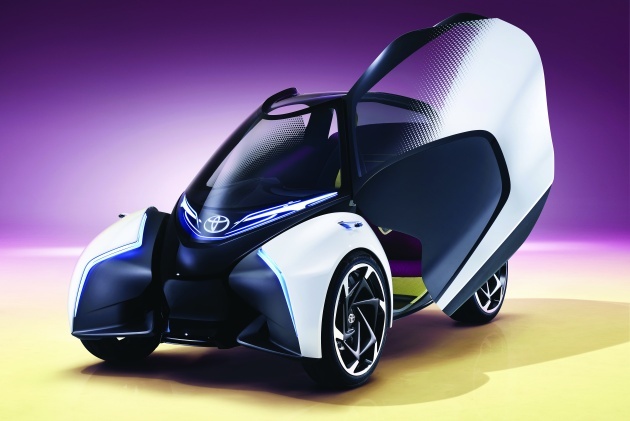 Being a three-seater vehicle, the i-TRIL is quite a bit wider than the tandem two-seat, three-wheel i-ROAD, measuring 2,830 mm long and 1,460 mm high, with a front track width of 1,200 mm and a rear track of 600 mm. Like the i-ROAD, the car leans into a corner, with the rear axle separated from the main body to remain perpendicular to the road surface. The lean angle is limited to 10 degrees, which Toyota says increases stability, grip and driving pleasure, with less risk of inducing motion sickness. With a steering angle of 25 degrees, this gives the i-TRIL a turning circle of just four metres, similar to an iQ. Power comes by way of a rear-mounted electric motor, and with a weight of just 600 kg, the company targets a range of 200 km. There are no pedals inside – instead, acceleration and braking are handled by drive-by-wire control modules that extend from beneath the stretch fabric on the dashboard, becoming the “steering wheel;” a head-up display provides instrumentation. 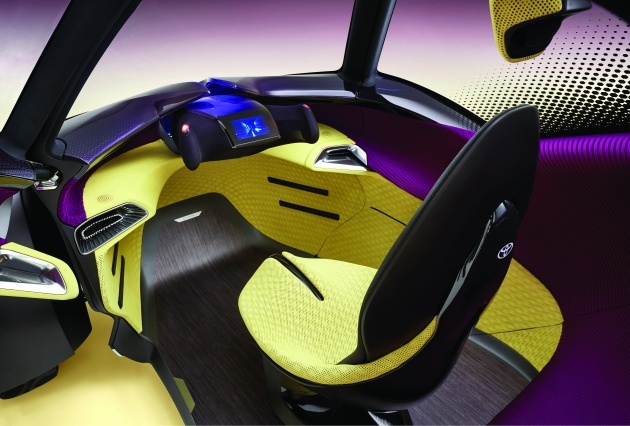 Being a futuristic concept, the car can also drive itself, with the left and right side of the dashboard illuminating to let occupants know which side it will lean into when cornering. At the front, the i-TRIL is distinguished by the flowing headlight graphic and separate front fenders, the latter facilitating the lean function. Along the sides, the transition between the transparent glazing is gradated to emphasise the car’s dynamic silhouette, while the rear features full-width tail lights to emphasise the added width over the i-ROAD, done to fit a two-seat rear bench. Entry to the interior is via massive butterfly doors, with part of the floor going with it to ease egress. The centre driver’s seat – which can swivel 20 degrees left or right for a more graceful exit – is upholstered in Alcantara and features a centre rib at the base for a snug fit, while the rear bench is covered in purple fabric. The flooring is made of wood, and all the materials are recycled.